November growth in private payrolls was disappointingly low, since I and many others had been hoping to see a modest pickup in the pace of job creation. 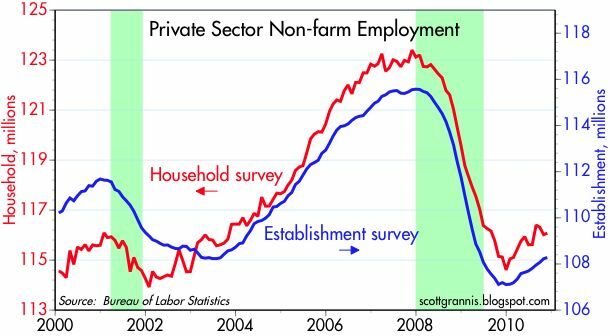 Instead, the private sector added between 59K jobs, according to the household survey, and 50K jobs, according to the establishment survey. From a longer term perspective, these surveys tell us that, from the low in jobs last December, the private sector has created between 1.47 million jobs (household) and 1.17 million jobs (establishment). Taking an average of the two, that works out to a gain of roughly 1.3 million jobs, for a rate of growth of about 1.3%. That's only enough to keep pace with the natural growth in the labor force, which is why the unemployment rate hasn't changed much over the past year. Nevertheless, despite the failure of job growth to pick up, there is no sign that it is slowing down. The economy continues to plod ahead at a slow pace. If this keeps up, and worker productivity rises at its long-term average pace of 2% per year, then we can expect to see about 3.5% real GDP growth going forward. My growth expectations remain unchanged since Dec. '08: 3-4% on average. If Q4 growth comes in at 4% then growth for the year will have been 3%. Ho-hum, not much to write home about. All of this is old news however. What matters most right now is what happens to the Bush tax cuts. If they are allowed to expire that would be bad news for growth next year. But it looks like there is a good chance they will at least be extended for a year or two for all taxpayers, and that would be good news. Uncertainty would decline, and tax rates on capital gains and dividends would remain low, thus encouraging new job-creating investments. More and more, Bernanke is looking right. This economy needs pep, and is a loooooooooooooooooooooooonnnnnnnnnnnnnnnnnnnnngggggggggggggg way from any inflationary build-ups. BTW, latest issue of New Yorker has column by James Surowieki (sp?) praising QE2. Worth reading. Many economists believe that reporting the number employed as a percentage of the civilian population provides a more accurate description of the current state of employment than conjecturing the number of "unemployed" in a population. The US employment to population ratio reached a historical peak of 64.4% on an annual basis in 2000. Dr. McKibben: Assuming the same percent of Americans want to work today as in 2000, this bespeaks of enormous underutilized resources. And huge pools of available labor holding down wages.